Sina Pharmacy has the solution for the above uncomfortable leg problems. 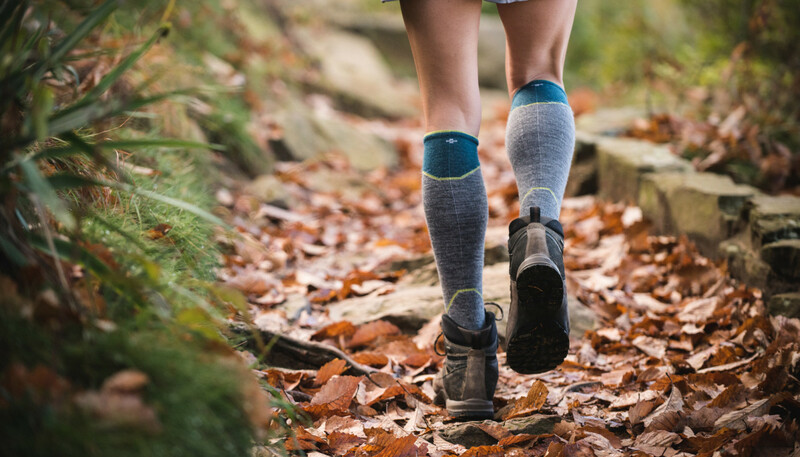 Talk to us about compression socks or stockings which are vital for the prevention and treatment of varicose veins and other circulatory problems. Compression stockings and socks can help reduce everyday strain on your busy legs. Graduated compression helps to pump blood back up to your heart - improving circulation! We carry a complete selection of graduated support hose that may help. Our certified fitters will help you choose the best product to improve the health of your legs. Sina Pharmacy carries Sigvaris, and Sockwell brand compression stockings. Q. Who benefits from wearing compression? Q. What is gradient compression? A. Gradient compression delivers a squeezing to the leg that is tightest at the ankle. The amount of squeezing or compression gradually decreases up the leg. Compression is expressed in mmHg (millimeters of mercury). Q. What is Compression Therapy? A. Compression therapy refers to the benefits gained from the use of specialized stockings or bandages in the management of chronic venous disease and lymphedema. Individuals suffering from chronic venous disease (often called insufficiency) present with leg complaints of fatigue, heaviness, and aching. Gradient compression stockings pioneered by Sigvaris remain the standard in the management of chronic venous disease. Gradient compression delivers a squeezing to the leg that is tightest at the ankle. The amount of squeezing or compression gradually decreases up the leg. While the exact mechanism of action of compression remains elusive, compression is believed to provide two primary benefits to individuals suffering from chronic venous insufficiency. Perhaps the most important effect is that compression increases the pressure in the tissue under the skin (subcutaneous) thereby helping to reduce and prevent swelling. The compression of this subcutaneous tissue helps move excess fluid (swelling) back into the capillaries (tiniest of the blood vessels) and helps prevent too much fluid from leaking out of these little vessels. Secondly, compression reduces the ability of the superficial veins in the leg to expand and overfill with blood. This in turn helps prevent blood in these veins from flowing backward causing congestion. Congestion in the leg accounts for the leg complaints, swelling, and skin changes common in persons with venous problems. Q. How do compression stockings work? A. Compression stockings are made of a special elastic fabric. They are very tight at the ankle and are less tight as the stocking moves up the leg. This graduated tightness helps the leg muscles squeeze fluid up the leg, which improves blood flow from the leg back to the heart and decreases leg swelling and pain. Q. Are there reasons an individual should not wear compression? Q. Why are elastic stockings so hard to put on? A. Latex is a natural substance that comes from the rubber tree. Latex can be used in textiles in two forms: Dry natural rubber and natural rubber latex. Q. Do Sigvaris stockings contain latex? A. Allmost all of Sigvaris stockings are latex-free. The elastic used is a synthetic spandex. The only Sigvaris stocking that contain latex is Natural Rubber (500) Stockings. Q. When can a knee-length be recommended? A. A knee-length gradient compression stocking is generally recommended to prevent or manage signs and symptoms of chronic venous insufficiency or other causes of lower leg swelling and skin changes. When swelling or varicosities are present above the knee then a thigh, chaps, or pantyhose style may be a more effective choice. Please consult with your pharmacist or physician for assistance. Q. Is there a layering or additive effect of compression? Can I wear one compression stocking on top of the other instead of wearing a higher compression stocking? A. Yes, there is an additive effect with compression stockings. For example, some doctors instruct their patients to wear one level of compression in a pantyhose style and then wear a knee-length compression stocking over the compression pantyhose. Please consult with your pharmacist or physician for assistance. Q. Why are compression stockings prescribed after a blood clot (DVT) in the leg? A. Knee length gradient compression stockings are often prescribed for a patient who has sustained a deep vein thrombosis (DVT) or blood clot in the leg. The stockings are helpful in: 1. Controlling the swelling in the leg that occurs with DVT, and 2. To help prevent the development of post-thrombotic syndrome that may occur several months after the DVT. Q. What is post-thrombotic syndrome or PTS? A. Post Thrombotic Syndrome (PTS) is a collection of subjective complaints and clinical signs following a thrombotic episode. PTS manifests itself with clinical signs of swelling, dilation of the veins around the ankle bones, pigment changes in the skin of the lower leg along with subjective complaints of spontaneous calf pain and/or pain with standing/walking. The syndrome can present with symptoms ranging from mild severity to excruciating or incapacitating pain and swelling. PTS occurs in approximately 40% of persons with DVT and varies from person-to-person in its severity. Special graduated compression stockings are designed to decrease or prevent swelling. They keep fluid from pooling in the ankle, calf and thigh. In the past, compression stockings were recommended for most patients with DVT because it was thought the stockings could prevent PTS. Recent research however has shown that elastic compression stockings after a first episode of leg DVT do not prevent PTS Read More. Even though compression stockings may not prevent PTS, they may make your leg feel better and reduce pain and swelling. Ask your health care provider if compression stockings would be helpful for you. Q. What is the difference between an anti-embolism stocking and a medical compression stocking? A. Anti-embolism stockings are designed specifically for bed bound (non-ambulatory) patients to help prevent blood from pooling in the veins of the leg. Pooling of blood in the veins of the leg may contribute to blood clots forming in the veins. Anti-embolism stockings are generally made for short duration of wear during a hospitalization. Anti-embolism stockings deliver gradient compression and, depending on the manufacturer, the compression delivered to the ankle is in the range of 13 - 18 mmHg. These stockings are normally only available in white. After discharge from the hospital or extended care facility, if you need to continue wearing gradient compression stockings (such as Sigvaris compression stockings) your physician can advise you on an appropriate level of compression. Sigvaris compression stockings are in the 15-20 mmHg, 20-30 mmHg, and 30-40 mmHg ranges and are ideal for long term wear and comfort. 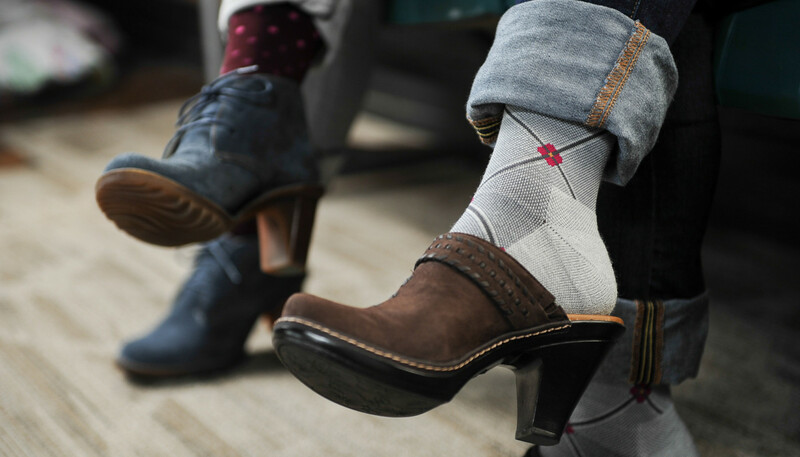 Sigvaris compression stockings look fashionable and are available in a variety of colors and styles. Q. How do I wear compression stockings? A. Compression stockings can be worn following a DVT once the initial more pronounced swelling of a DVT has improved, after about 1 week. Put your stocking on first thing in the morning, before you are up on your feet. Remove stockings at bedtime. There is no need to wear them at night. Most stockings are sold in pairs, but you need only to wear a stocking on the leg affected by the DVT. You should wear compression stockings every day for as long as they continue to make your leg feel better. The length of time will vary by individual and may be weeks, months or years. For example, if swelling has disappeared a few weeks or months after the acute DVT with the use of the stockings, you may stop wearing the stocking. If swelling recurs, then the stocking should be worn again. If there is no more swelling, then stockings are not needed any more. Q. How do I put on the compression stockings? Put compression stockings on first thing in the morning before you start moving around much, when your leg is less swollen. Makes sure your skin is dry. If you use lotion, be sure it is completely absorbed before putting on the stocking. Talcum powder can help make the stocking glide on more smoothly. Put the stocking first completely over the foot, then over the heel and finally up covering the calf or thigh. Getting the heel in position first will make the process easier. Do not pull the stocking by the top. Gently pull the stocking up the leg, smoothing the extra material as you go along. For knee-length stockings, once on properly, the top of the stocking should be about one-inch below the bend of the knee. We carry special gloves which can help guide the stocking smoothly over the leg. Do not fold or roll down the stop of the stocking. If you feel that is needed, then you probably need a shorter stocking. If your stocking keeps falling or sliding down, you may need a different size. Q. Why doesn't my compression glove completely control the swelling on the back of my hand? A. The back of your hand may swell because unlike the fingers or leg, the hand is more flat in shape than round. Inserting a foam pad under the glove over the back of your hand can increase the pressure to the back of your hand where it is swelling. Q. Do Sigvaris compression stockings and arm sleeves require a prescription? A. The Sigvaris stockings and arm sleeves with compression between 15-20 mmHg do not require a prescription. Usually these stockings are not used to treat a condition but are used for preventative purposes. However, the higher compression stockings or arm sleeves (>20 mmHg) require a prescription from a physician. Please note that for certain styles of 15-20 mmHg compression stockings, our pharmacist may choose to require a prescription or physician order for the safety of the patient. Q. Do Sockwell compression stockings require a prescription? A. The Sockwell stockings and arm sleeves with compression do not require a prescription. Usually these stockings are not used to treat a condition but are used for preventative purposes. The compressions available are 15-20 mmHg and 20-30 mmHg. Q. Is uniform compression effective? A. Yes, uniform compression is effective clinically in managing edema. However, research has indicated that gradient compression in the legs is more effective than uniform compression in improving venous return. Q. Why should compression stockings for the legs be gradient? A. Gradient compression is specifically important to the legs. When we stand still the forces of gravity increase the pressure within the veins of the legs - greatest at the ankle and decreasing gradually up the leg and body. This pressure depends on the vertical distance of the column of blood from the heart to the foot. Approximately 86 mmHg of pressure is inside the veins of the ankle of a 5'7" adult in the quiet standing position. In the vena cava vein just before it enters the heart, the venous pressure is about 2 mmHg. Gradient compression stockings are designed with the pressure greatest at the ankle and decreasing up the leg in order to counter the effects of the higher venous pressures. Q. Does the unaffected leg need to wear compression? A. Only the leg with the symptoms or disease needs to wear the compression. Some people prefer to wear compression on only the affected leg. Others may opt to wear the same brand of stocking but in a lower compression level on the unaffected or healthy leg. For example, your physician may have told you to wear a Sigvaris 30-40 mmHg stocking for the chronic venous insufficiency present in one leg. You may choose to wear a Sigvaris stocking of 15-20 on the other leg. Always verify with your physician that the problem is present in only one leg. Q. What is "economy class syndrome"? A. Economy class syndrome is a term used to describe the medical condition deep vein thrombosis when it follows extended airplane travel. For further information please refer to your pharmacist or physician. Q. What is the best time of day to measure for compression stockings? A. It is best to measure earlier in the day before swelling builds in the legs. Measurements taken later in the day after swelling is present may result in choosing a stocking size that is too large. Many clinics that are unable to see patients earlier in the day will elevate, bandage, or pump the legs for a period of time before measuring in order to reduce any swelling that is present. Q. How do I care for compression stockings? Follow the instructions on the label for washing the stockings. Wash the stockings after each use (if possible). Washing removes oils and dirt and helps fabric keep elasticity. Hand or machine wash - check the label for specific recommendation. If machine washing, use of a mesh laundry bag can protect the stockings during the wash cycle. Wash in mild soap. Do not use detergent as this can affect the elasticity of the fabric. Pat dry the stocking with a towel. Do not wring and twist. Air-dry the stocking. Some stockings can be dried on the delicate cycle of a dryer - check the label. Replace compression stockings as needed. Over time, the fabric will lose its elasticity. Stockings last about 4 to 6 months.